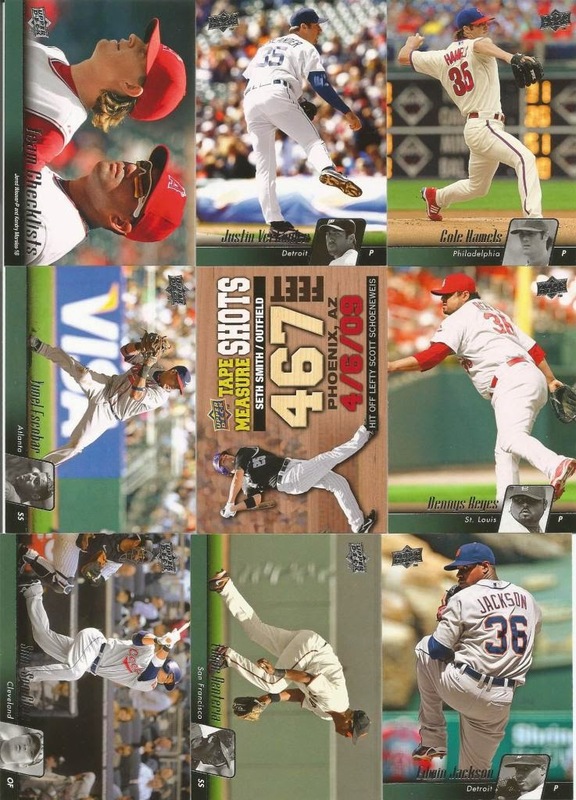 Caught Stealing Home: HOFers, Manny Being Manny, and more! Quite some time ago now, I received cards from Stealing Home. The note said, "Here's hoping none of these are dupes." 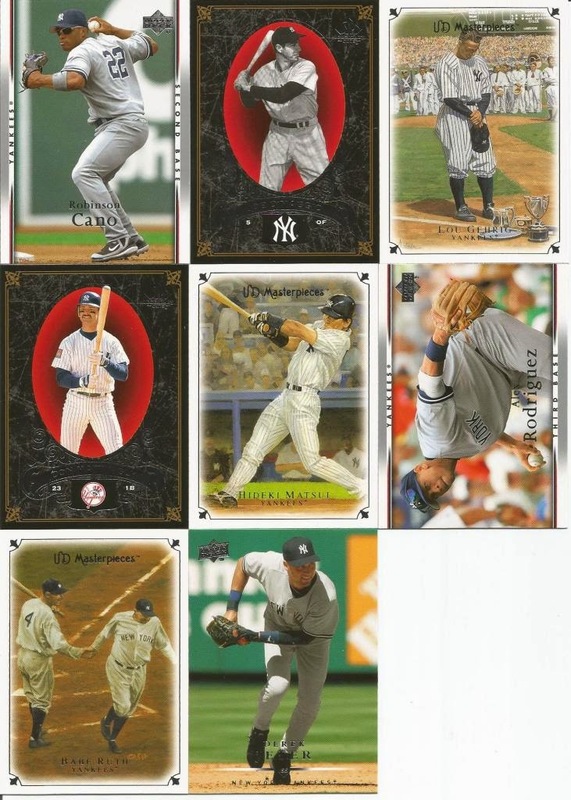 I know that at least some of them are not dupes, and a couple I'm not sure about. 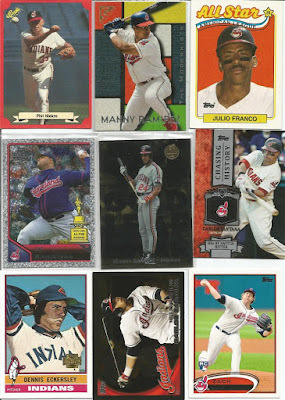 But, dupes or not, I am always thrilled to get some Tribecards in the mail! 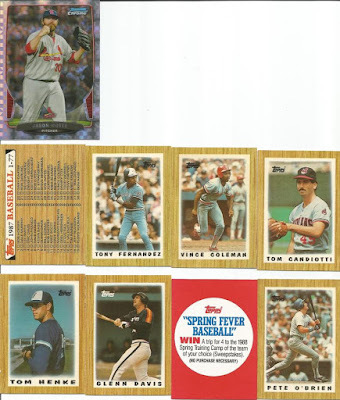 Phil Niekro 1988 Red Classic - I've always been a fan of the Classic cards. On the back, it says, "Phil begins the 1987 season with the Cleveland Indians in quest for his lifelong desire to be in a World Series." Unfortunately, that dream never came to be, however, 10 years after joining the Indians, he would be inducted into the BBHOF. Not a bad run! Manny Ramirez 1996 Topps Gallery "The Modernists" - Ah, just before "Manny was being Manny," he was a kid with amazing potential. The back of the card reads, "Ramirez is perched on the precipice of greatness." He was part of the mid-90's Indians resurgence, making both World Series appearances and hauling in a slew of awards as a Triber. 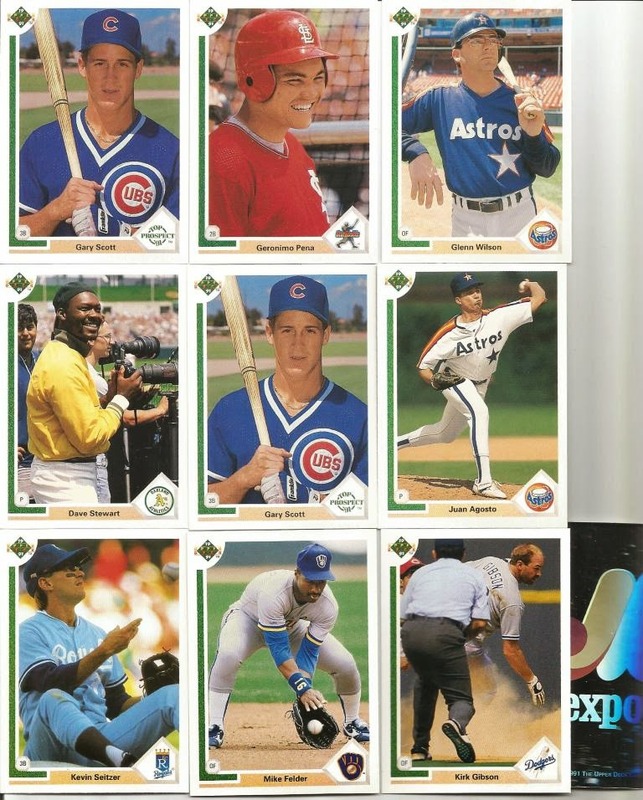 Julio Franco 1989 Topps All-Star - Before there was Manny and rest of the 90's killer Indians team, the Tribe suffered through the 80's. 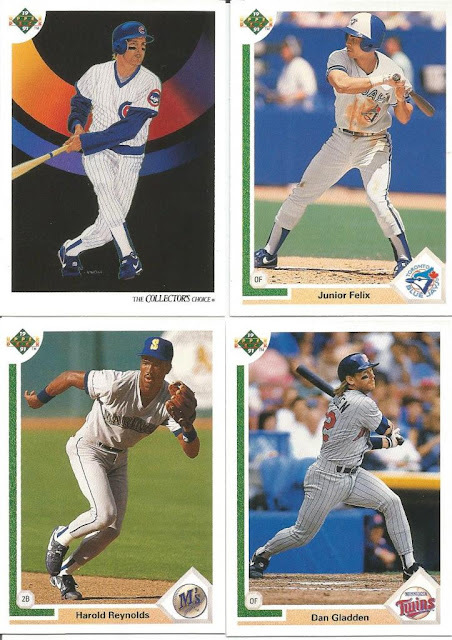 Even then, though, we had players like Julio Franco. In '88, he had a 21-game hitting streaking that was later followed up by a 22-game hitting streak. He was part of the '97 team that made it to the World Series as well. Franco still remains an all-time Tribe fan favorite. CC Sabathia 2011 Topps Lineage Diamond Platinum All-Star Rookie - Wow, that's a mouthful! Sabathia dominated from the mound. This card showcases his 2001 rookie year in which he "finished second to Ichiro in ROY voting." Yeah, you read that correctly: a pitcher gets 2nd billing for ROY. And, you see who he lost to, right? Freakin' Ichiro. Not bad way to end your rookie year at all! Manny Ramirez 1994 Gold Leaf Rookie - Ramirez is one of those players that folks knew was going to be good. He was batting over .300 in the minors when he came up in '93. Only managing a .170 AVG in 22 games, that came with a double, two home runs, and 5 RBIs. The pot was just starting to boil. Carlos Santana 2013 Topps Chasing History - This card celebrates Santana's ability to knock it out of the park from either side of the plate. In 2011, he hit 27 home runs batting switch. I'm sure there are stats somewhere that show which home runs came from which side of the plate. Dennis Eckersley 2001 Topps Archives '76 - This card is iconic Eck. 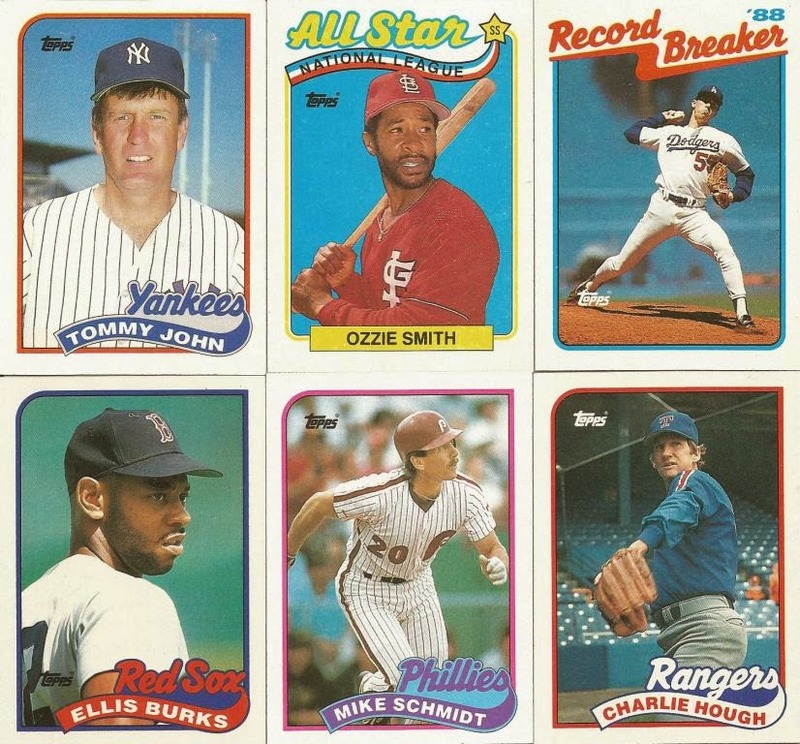 This reprint of his 1976 rookie card shows a determined young man poised to rip on in there. Of course, hindsight being what it is, we know where things went from here - an amazing career and the HOF. I love that I have the actual card and here is the Archives version. This is a very cool card. Except the back. Sorry, but who had the idea to print such a dark green background with black text!? Ah well. 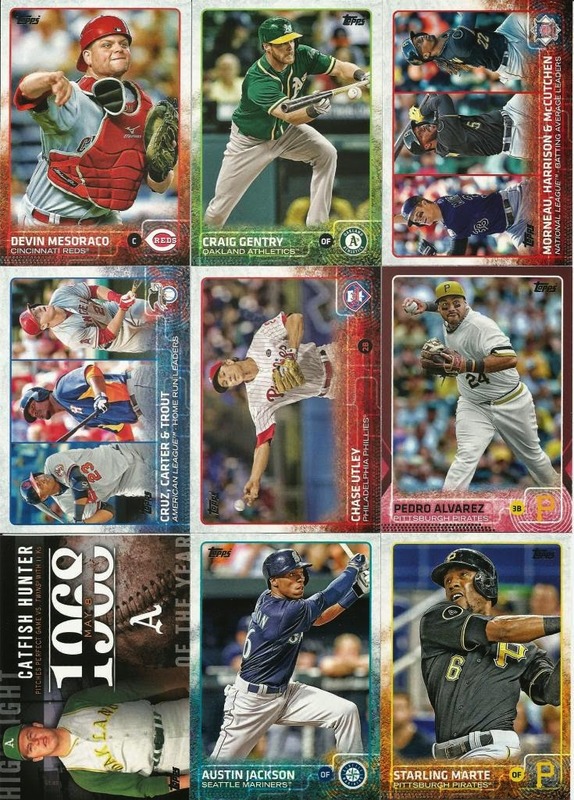 Zach McAllister - 2012 Topps - Ah, this card features the official MLB "RC" logo. After an embroiled brouhaha over what is or is not considered "rookie" card status, the MLB decided they would call the shots. It's all very stupid in my book, but then again, they didn't ask me. In any case, McAllister has been on-again, off-again with the Tribe over his 5-year career thus far. He's been moved to the bullpen and that seems to suit him (and the team) well so far. Thank you so much, Stealing Home for these cool Tribecards!! Hey there, folks! welcome to FRIDAY! Wahoo!! Tonight, I am going old school and a throwback to old school. I've got a pack of 1987 Topps Mini Leaders and a pack of 2015 Heritage. I'm not sure which one to open first, so let's do this by flipping a card. 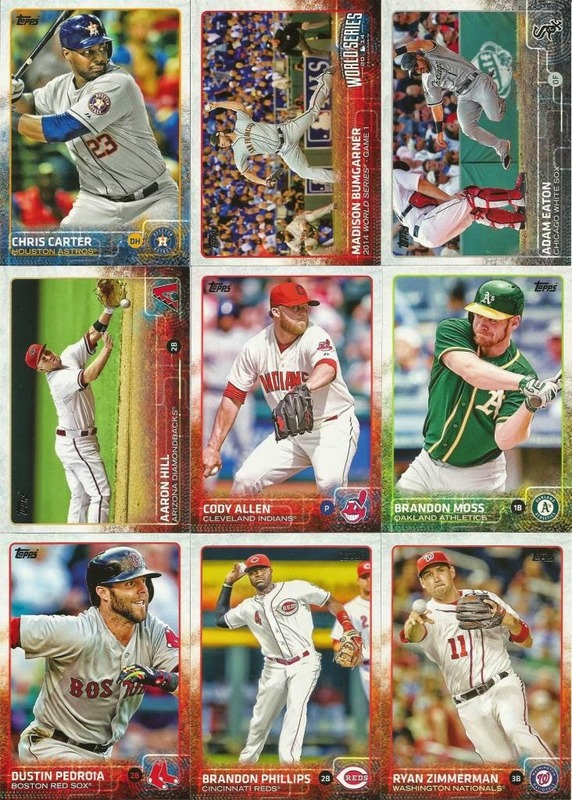 I have a 2013 Jason Motte Bowman Chrome Refractor. Heads, we open the Leaders first, tails we open Heritage first. By the way, Idaho Astros, you get the card! Congrats! So, we start with the Leaders! Hey! I pulled a Triber! Wahoo!! We'll have some fun little cards for the next draft, too. Congrats to the managers who already own some of these players. Now, let's rip open the 2015 Heritage! Hey, great job by the Hadsalls to score two players from this pack! Congrats to the other managers as well! I'm looking forward to Stargell's draft appearance for sure! Haha, that's a lot of exclamation points. Yes, I am that excited about bit of cardboard. How can you not be!? Yesterday's post was actually going to be a multi-pack post, thus the numbers that appeared in the title. That didn't happen, so I've fixed that one and have set this one to the correct number. I'm sure I'm the only that even pays attention to such details, but it's important to me that I explain things and that I keep things in as much of an order as I can - which isn't saying a lot, lest you think I am OCD about things - I am not. I leave that to my wife in our family. That's not a slam on her, it is just how we are oppositely wired. 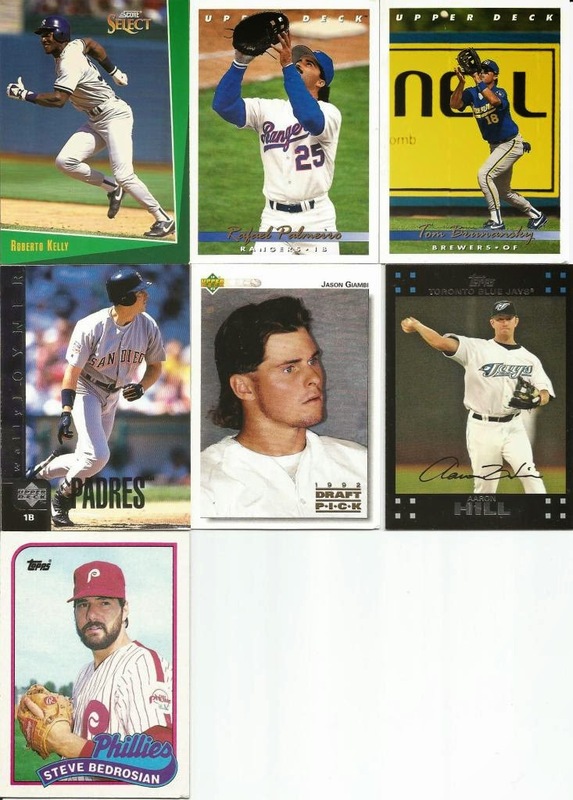 As for the OOTP game, Raz got me to thinking, and so I am going to make sure that older players are edited such that their birthdays are around 1992 - I'm talking about players currently sitting at 50 or above. That should help keep them in the roster. We'll try it and see what happens. Why not, right? In the meantime, I forgot to say what the contest actually was: viewers had to send an email to me with "PERFECTION" in the title and list the first Indians player to have a perfect game. It was supposed to be a trick question, but instead I tricked myself. The true answer to the way the question was asked is "Len Barker." I was looking for Addie Joss. But, the team wasn't called the Indians when he did it, thus I tricked myself. Josh answered with Len's name every day, or nearly every day if not. In fact, Josh was the only one to answer at all. So, THANK YOU, Josh, for watching my goofy updates. :-) Actually, THANK YOU to anyone that watched, even if you didn't enter. Wow, that was certainly loaded up with free agents! I am hoping to open more packs per week so we have large player pools for the drafts. We'll see how it goes. Congratulations to the four folks here that added wax to their stacks! Heya! I am about to send the draft list to the managers. Before I did that, though, I want to add some more free agents to this week's draft. #PackADailyCircus - De Draft! de Draft! And a WINNER!! The results have been added to the managers/Players list, though I just realized that I have some spelling anomalies that make the list seem a bit quite not unlike something that is not entirely alphabetized (or something like that). I'll get that fixed. The draft for *THIS WEEK* will go out before the end of the evening tonight (Wednesday May 27). The deadline will be Noon on Sunday, May 31. NO SKUNKS will be Jennings64 and Ventura County Royals! Let's talk about our WINNER!! You may recall that I had mentioned a contest that would be announced in one of my video updates. Well, I announced that contest in the May 13 update. The contest? A free OOTP 16 code! JoshD (aka Ventura County Royals)!! WAHOO!! Josh, I will be sending your code very soon, so be on the lookout in your email! Today's pack break will be released shortly! 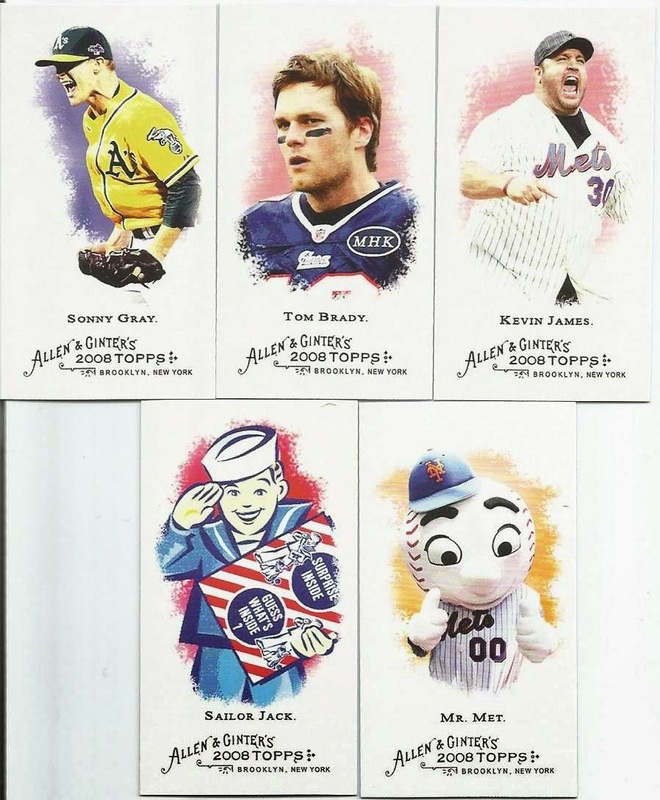 #PackADailyCircus - 052 - Who gets 4 hits with a Back-to-Back!? Hey there, everyone! 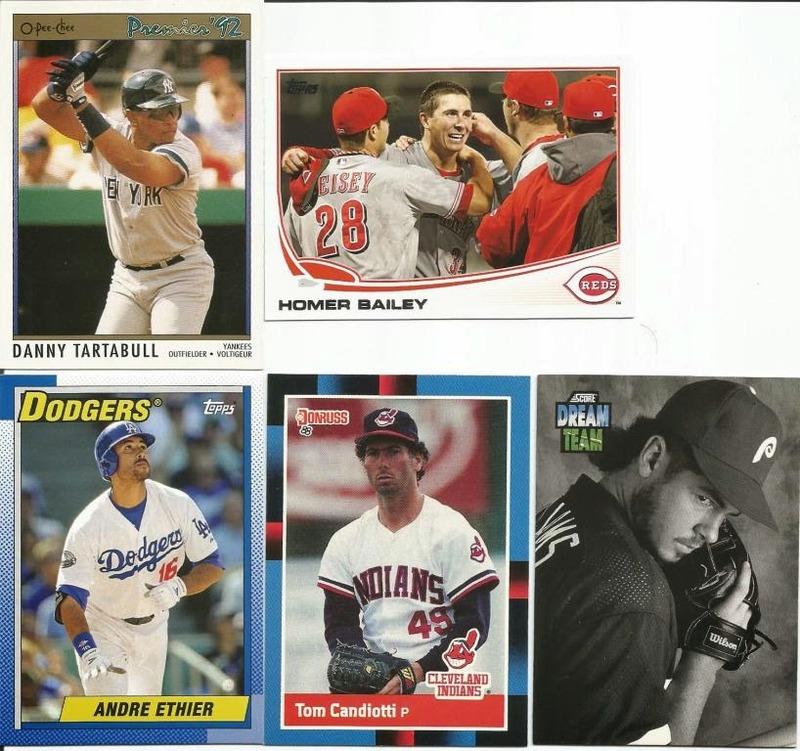 Thanks for dropping by the site for today's pack break. 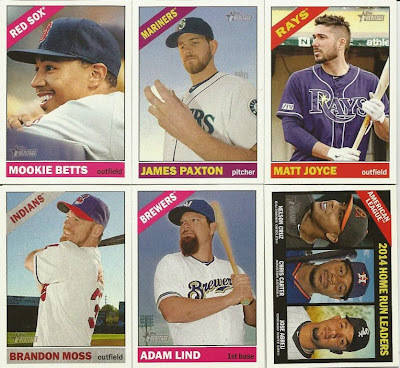 I reached into the big ol' box and the pack we have here is another box of Nachos Grande's mini Allen and Ginter! I'm not sure how many of these he sent, so I hope we've got at least another box or two in our stash. I love these things! #PackADailyCircus - 050/051 - Double helping of Sushi! Hello, everyone! Today is Memorial Day. If you have not taken a moment or two to stop and consider the sacrifice so many have made while serving in the US Armed Forces, please just take a moment here. We enjoy busting packs and collecting cardboard and doing whatever it is we do to earn our living, but sometimes, we need to look beyond ourselves to pray or think about loved ones we may have known - or have never known - that were sent to a place they might not have ever been before to die away from family and friends, loved ones and colleagues. In the recent poll for which cards to scan, we had a tie between "All cards" and "Currently Drafted Players." So, I will start posting certain packs with all the cards scanned just to see how that goes. We'll start with today's for fun. Today, we're breaking packs for yesterday and today. So, two packs for your viewing pleasure. Congratulations to the Sushi for getting two hits from this pack! 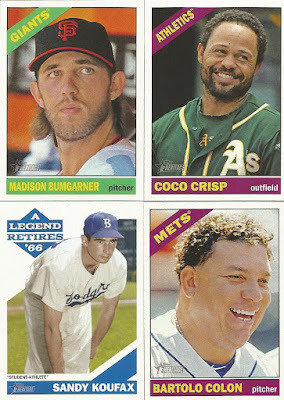 Also, congrats to the other three managers who picked up cards, too. Next pack: A Bo Rosny custom "BoPack"
Wow! 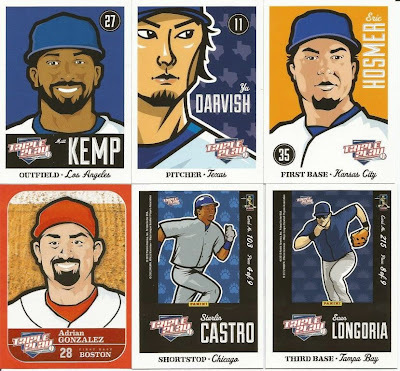 The Sushi grab ANOTHER two-hit pack! Way to go! This was a fun pack to open. I really like these custom packs you guys have come up with. I don't know if they are randomly filled or if there is a method to the packing of the packs, but either way, I'm enjoying them. Congrats to each manager who pulled one of these random cards. **NOTE (added after this post originally released): OOTP automatically fills out teams, regardless of my "cleaning house." So, rosters, etc in game and at padcircus.com may not reflect actual drafted players and/or ONLY drafted players. Welcome to my world. The Players/Managers list should be accurate, however. Hello, everyone! I did not realize until today that I did not post a pack yesterday. The missing draft had me a bit bamboozled, I guess. I want to thank Stealing Home and Bo Rosny for supply me with cards! That is awesome!! I will do a separate post for those soon. In addition to Indians cards, Bo included a slew of pack, including his own custom version called "BoPack!" I am looking forward to opening those during the season. I am cleaning up all the rosters in the game. All non-drafted/game-created players are off the teams. Exceptions are Erin Rose and ProwlingCats because they do not have enough draftees to make up a team. Most teams will now have all players on the active list (or injury), since most of us barely have 25 players drafted so far. There are certainly exceptions! I believe I have the settings corrected. So, each team will have the game's AI provide lineups, batting order, etc for each team. Contradicting the previous statement: If *YOU* would like to manage your lineups, active rosters, etc, let me know. I will do my best to make those changes for you. I haven't figured out how to list reserve players online yet, but you can use the player search to find any player. I will update the online game after team rosters are fixed. *Note, if you know the hex code for the color(s) you want, that works best. Otherwise, I may have to interpret your color requests. Haha! If you have any questions about the OOTP game we're running, please drop me a line. I'm pretty open to making the game as "personal" for you as I can. Okay, now let's bust open two packs! 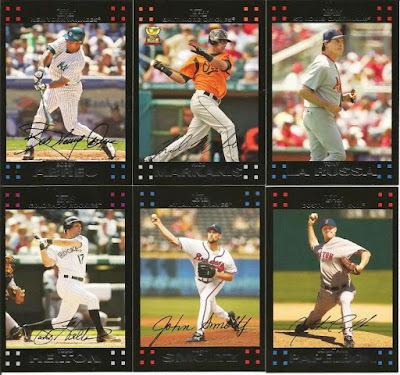 Derrek Lee 2003 Fleer Ultra - Marlins - Pedersejs (Wahoo!!) - As crazy as it may sound, I like the aqua and orange on this card. I must be delirious. Wayne Gross 1986 Topps - Orioles - Free Agent - I recognize him from his Indians cards, of course. 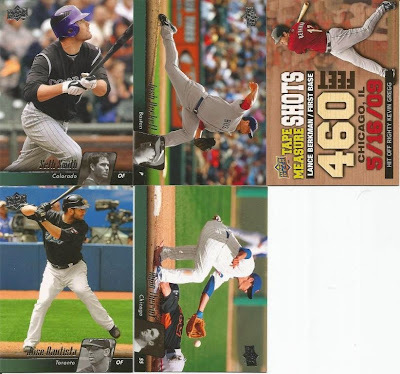 Adam Dunn 2013 Archives - White Sox - Northampton Therapists (Wahoo!!) 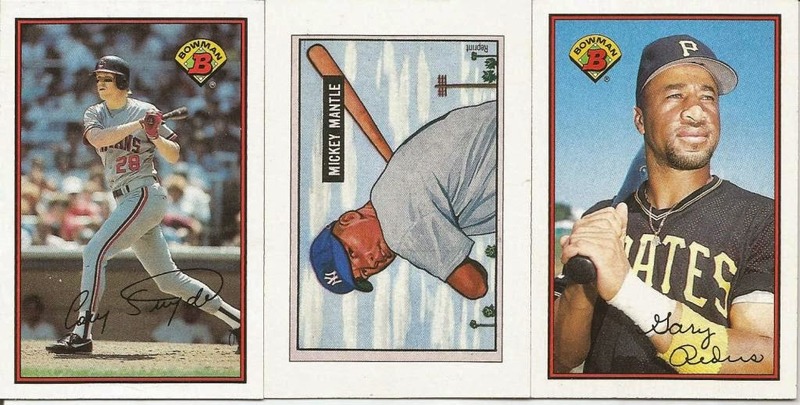 - Topps sure loves those cheesy bat-over-shoulder shots, don't they? Paul Konerko 2011 Topps - White Sox - SoxFan4Life (Wahoo!!) - This might as well be a UD unauthorized card. Heck, it almost would even have to be approved by MLBPA with its look. Charles Hudson 1988 Donruss - Yankees - Free Agent - I once worked with a guy named Charles Hudson. Different guy. There ya go. 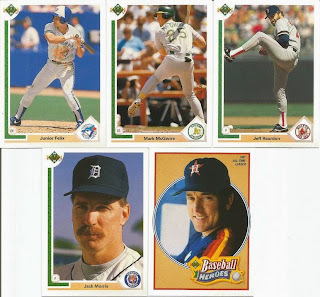 Dave Bergman 1988 Donruss - Tigers - Play at the Plates (Wahoo!!) - His face says, "I'm going to be stuck on this Donruss card forever, aren't I?" 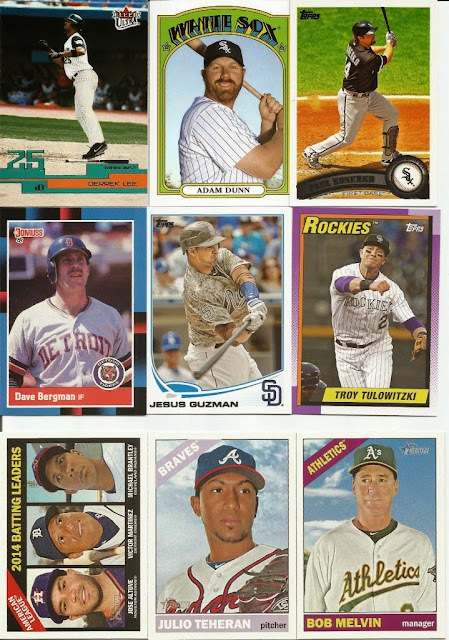 Jesus Guzman 2013 Topps - Padres - Bo Rosnys (Wahoo!!) - I was never a fan of the "camo" look. But, at least the whole shirt is camo and not just one stripe or something. 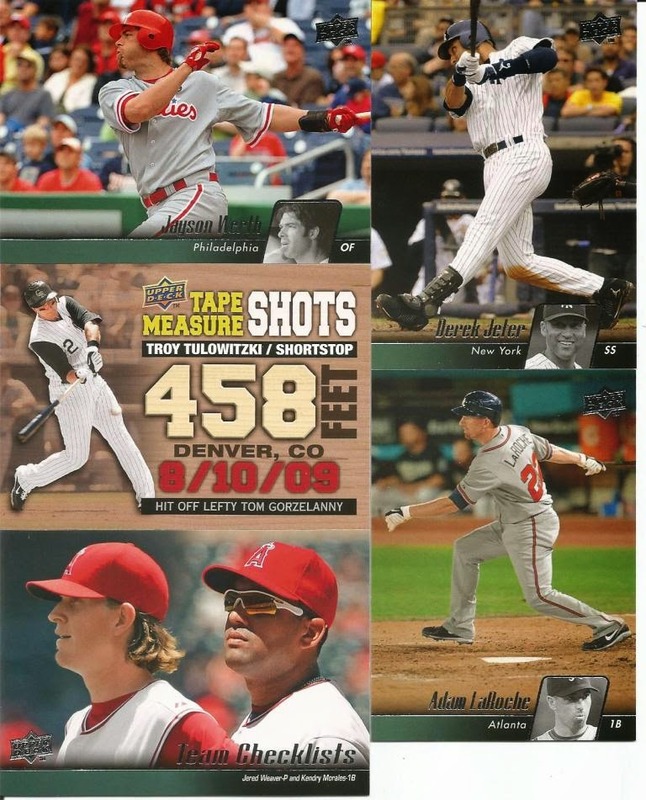 Troy Tulowitzki 2013 Archives - Rockies - Kentucky Quarrys (Wahoo!!) - Somone is peeking out of the lower corner, presumably out on the play. Clint Sammons 2008 Finest Certified Auto - Braves - Free Agent - This card... This card is GREAT! It is numbered 60/99 to boot! Didi Gregorius - Yankees - Free Agent - For some reason, I thought someone had him on their list. Ah, okay, he was on Arpsmith, but that was computer-assigned. Now you can try to draft him if you wish. Jose Altuve, Victor Martinez, Michael Brantley AL Batting Leaders - Astros, Tigers, Indians (Wahoo!) - New Jersey Hadsalls (Wahoo!! ), Jacksonville Jobu (Wahoo!! ), TSHensons (Wahoo!!) - Heya! A triber on a leader card! WAHOO!! There is also an ex-Triber as well. Great stuff! Tom Koehler - Marlins - Free Agent - Well, I can't think of a single thing to say about this card. I don't know if that is good or bad. Anthony Rendon - Nationals - Free Agent - Hanging out on a bench. It doesn't look like a dugout bench, though. At least he's smiling at whatever is happening to the side of the photographer. 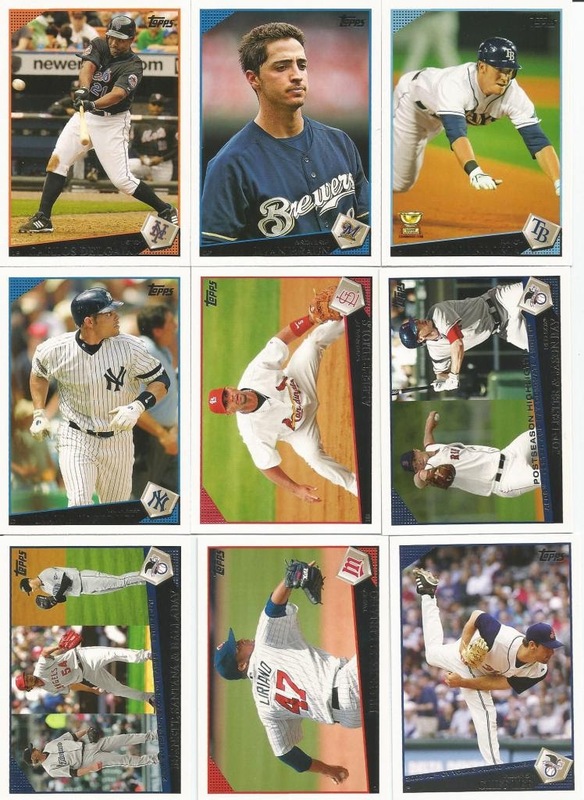 Logan Morrison - Mariners - Free Agent - There is something weird going on in the lower left of the card. It is as if his back/arm was hit with a Photoshop cloning eraser. Julio Teheran - Braves - Cobb County SuperChickens (Wahoo!) - This image has the "old school" look to it - shot from just below chest height, a little washed on image, pitcher staring off to the side a little. Rusney Castillo, Anthony Ranaudo Rookie Stars - Red Sox - Free Agent, Free Agent - I don't know how old Rusney is, but man he looks like a kid. 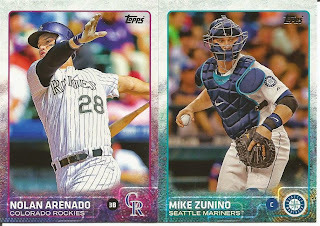 Something is amiss with Ranaudo's pic - looks heavily edited and flattened or something. 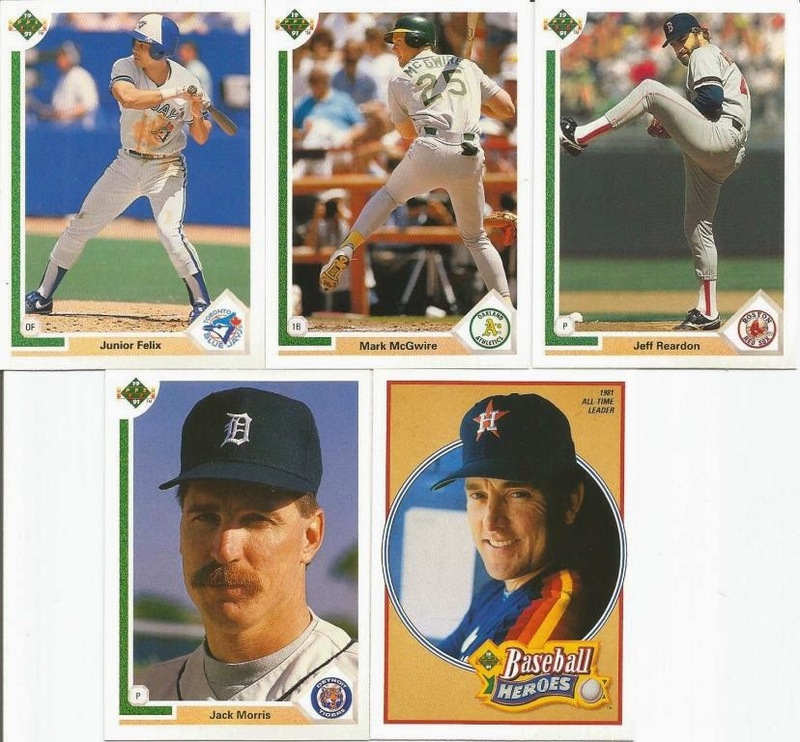 Bob Melvin mgr - A's - Jennings64 (Wahoo!!) - He does not look too happy to having his picture taken. 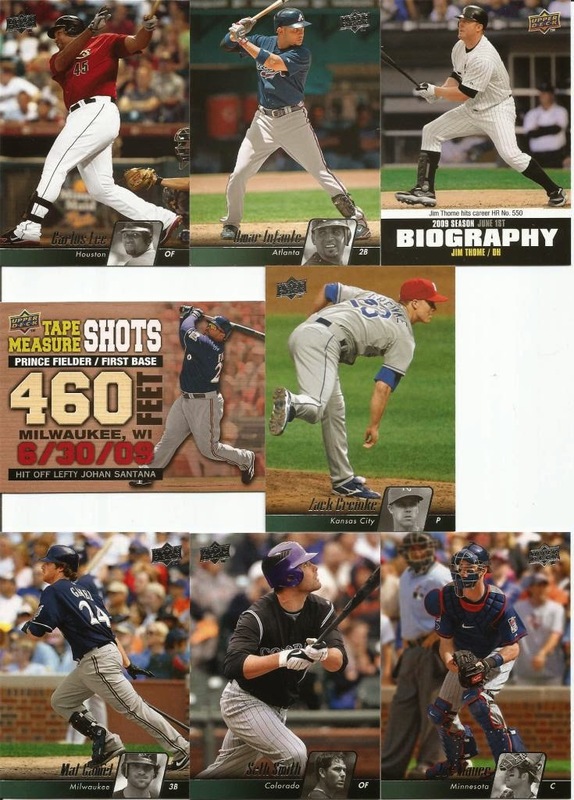 It is as if he is saying, "Does Topps seriously still take manager pictures? This is 2015, right?" 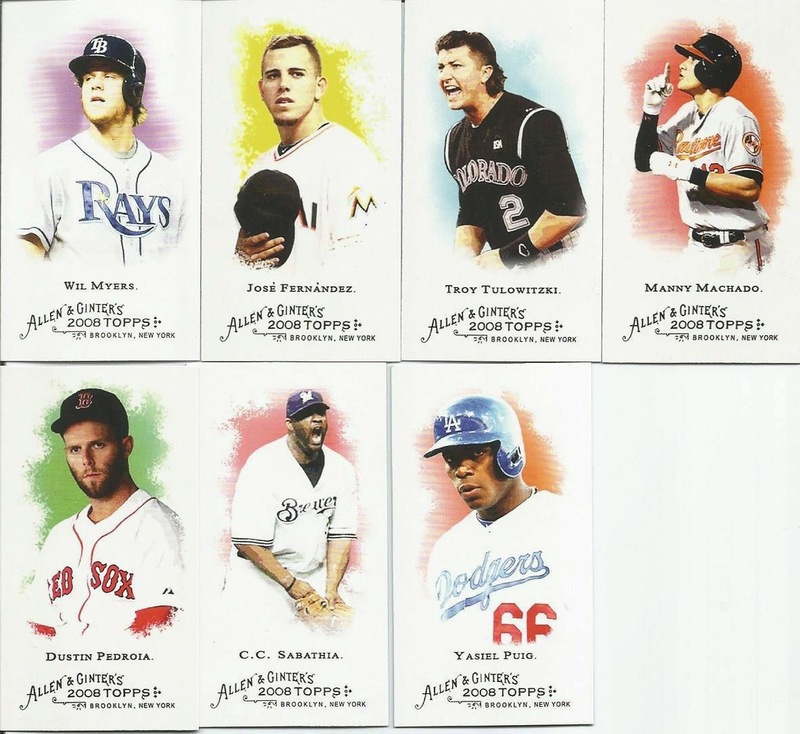 In this post, we're busting open a rack pack of 2009 Topps. For a little change-up, I am going to add my thoughts to each card we pull. Why not, right? Maybe it will provide a little entertainment along the way. And, if not, well, at least I gave you something to read other than a list of names, managers, and teams. Fredi Gonzalez - Marlins mgr - Free Agent - A couple notes: He looks like he is possibly giving a sign, and his left hand appears to be holding the logo in the lower corner of the card. Carlos Delgado - Mets - New Jersey Hadsalls (Wahoo!!) - This a card to show young ballplayers - his eyes are focused squarely on that ball coming in. Miguel Cairo - Mariners - Free Agent - If concentrate is directly proportionate to tongue sticking out, he is doing some serious concentration here. Ryan J Braun - Brewers - Thorzul (Wahoo!!) - I know this is the "J" Braun because Thorzul and I got into that discussion last season. See? I can learn! Brandon Jones - Braves - Free Agent - We have 7 Brandon's claimed in the game, and this is not one of them. Not yet, anyway. Evan Longoria - Rays - TSHensons (Wahoo!!) - He is sliding into home here, I believe. And, given the shadows, this is a night game. Ivan Rodriguez - Yankees - Jacksonville Jobu (Wahoo!!) - By looks of the ump in the back and Pudge's own directional stare, I'd say this ball was hit a long way. Heading home, I presume? Albert Pujols - Cardinals - Wilsons (Wahoo!!) - I can see why Topps went with a horizontal card here. How do they decide which players get vets and which get horizes? Casey Kotchman - Braves - Free Agent - I love these shots with the ball just coming into play at the batter. Jon Lester, Jason Bay Postseason Highlights - Red Sox - Thoughts and Sox (Wahoo!! ), Thoughts and Sox (Wahoo!!) - Hey, hey! Same manager has both players on one card! Do we call that a double play? AJ Burnett, Ervin Santana, Roy Halladay AL SO Leaders - Blue Jays, Angels, Blue Jays - Free Agent, Cobb County SuperChickens (Wahoo!! ), RJBreeze (Wahoo!!) - I am surprised that Burnett is a free agent, and then again not. 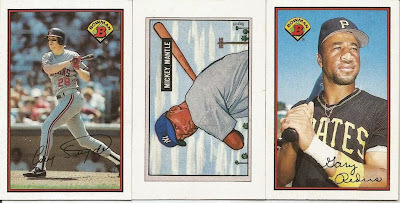 These triple-pic cards remind me of the old tear-away basketball cards from when I was a kid. Francisco Liriano - Twins - Cobb County SuperChickens (Wahoo!! Back-to-Back!) - Yes, this counts as back-to-back. Why? Because I said it does. Plus, my rules for such things does not specify whether it only counts for single player cards or not. Er, actually, there is no rule for these terms I make up. Cliff Lee - Indians (Wahoo!) 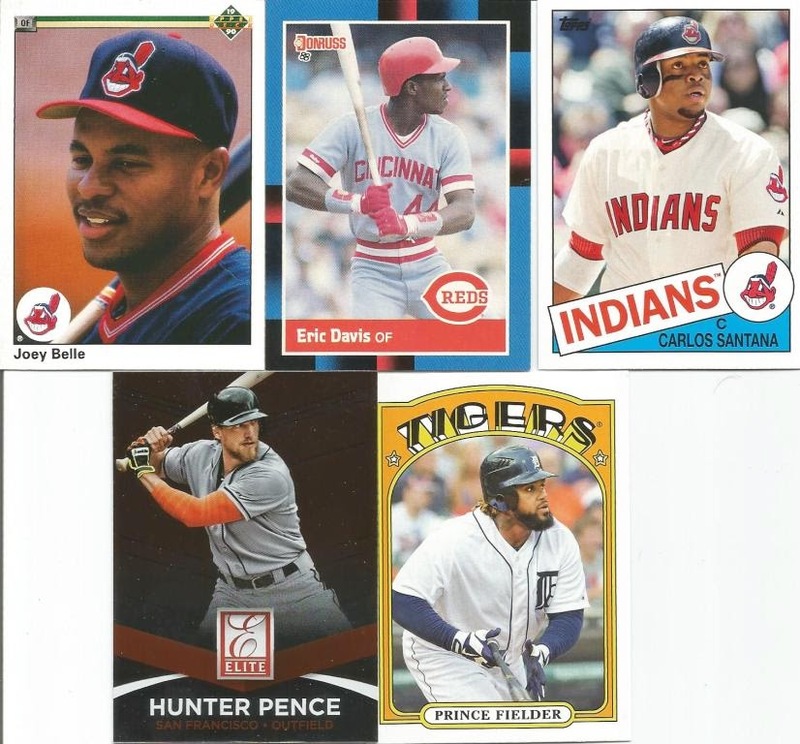 - Tribecards (Wahoo!!) - One of these days, I need to drive up the road and visit him in Benton. I'm sure he won't mind. Hiroki Kuroda - Dodgers - Free Agent - Great pitcher stance: Leg cocked, hand just about to draw the ball out of the glove. Scott Lewis - Indians (Wahoo!) - Free Agent - This guy is not to be confused with the Indians player Scott Leuis. Mainly because that dude played back in the 90's. Conor Jackson - Diamondbacks - Dominic FDNY (Wahoo!!) - This is a shot of a very high ball as he makes the play. Or at least, I think the ball is in the glove. Which, if it is, makes for one killer photo. Reed Johnson - Cubs - Free Agent - He is about to be swallowed by the ivy wall. Though, he is making one heck of a back-handed catch. David Newhan - Astros - Free Agent - he is squinting after making a hit. At this point, he's not sure what's happening. Mike Pelfrey - Mets - RJBreeze (Wahoo!! x2) - He's got the tongue-sticking-out thing going, too. All the fans in the background have been blurred out. Welcome to the age of Photoshop. 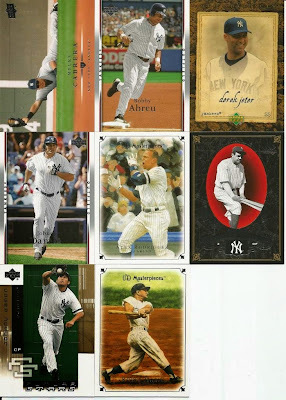 Xavier Nady - Yankees - Free Agent - I have always wondered if he is related to Charles Nady, and then I remember that his name was Charles Hagy and the answer is (most likely) "no." Brad Penny - Dodgers - Free Agent - Actually, this is not the most flattering photo, as it appears there is a hand with a baseball protruding from his nether regions. Yeah, I said nether regions. Carlos Pena - Rays - Play at the Plates (Wahoo!!) - The angle of this pic makes it appear that he about to go over the rolled up tarp. But, it's all perspective. Well, there you have it. 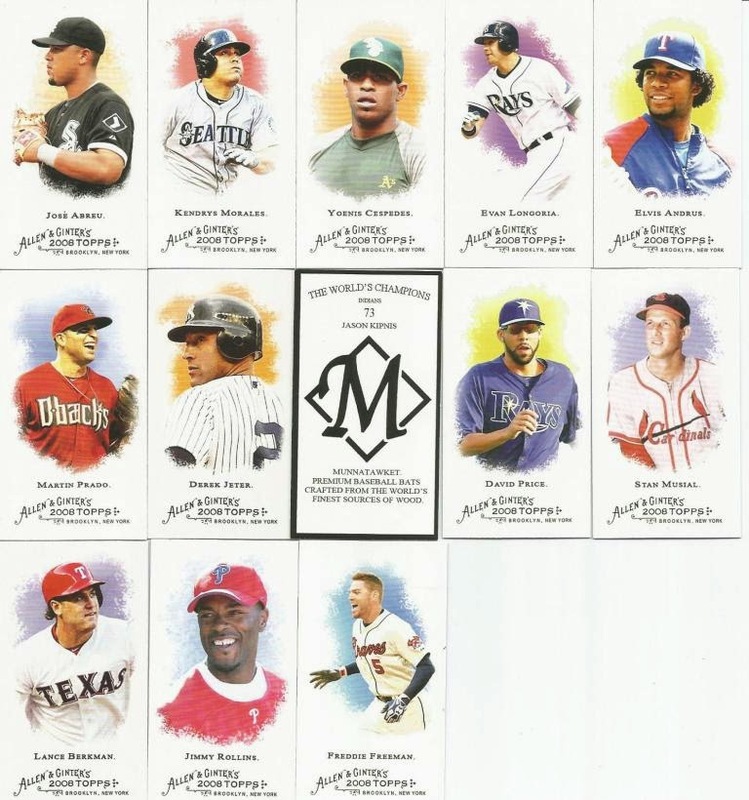 Congratulations to managers getting a card, or multiple cards, out of this pack! Hope you enjoyed the sidebars. Feel free to express your like, dislike or indifference below. Hello, everyone! sorry for the missed pack last night. Things got away from me. That's okay, we'll make them up today. We'll do two packs again here. The Managers/Players rosters have not been updated yet. My daughter had a softball game tonight (Monday) and she ended up getting walked 3-for-3 times and scored each time! Not a bad evening at all. Today is also my 24th wedding anniversary! It is so hard to believe how quickly time flies! WAHOO!! We hit a Perfect Pack! Congratulations, managers! That is so freakin cool!! Wow, I was getting worried there for a bit! I thought we went from a Perfect Pack to a no-hitter. Instead, we pulled a few card out of the pack for folks, so that worked out nicely. Congratulations, managers! Hey there, folks! I know you've been waiting to see what happened during the latest draft, so here ya go! Haha, well, I just realized Arpsmith's name was selected during the screen shot. I have no idea what that means. I still have to get the players into the master list, so I'll have that done late Sunday night (not that it isn't already that as I am typing this). 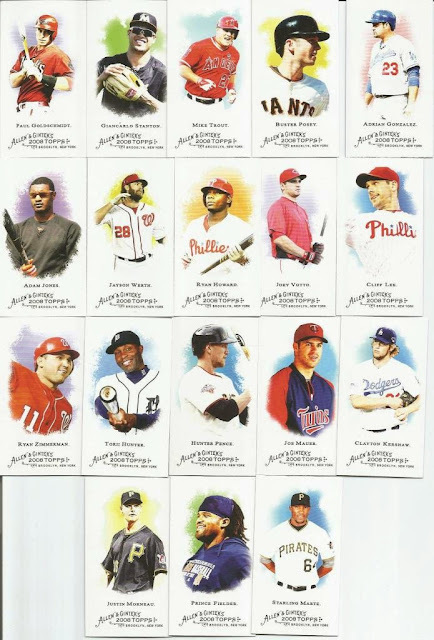 Then, I'll have a pack bust with updated rosters. Hello, folks! welcome back for another pack break. Today, we're on #42: Jackie Robinson's old number. Also happens to be the the answer to Life, the Universe, ad Everything. Coincidence? I don't think so. Well, we did not find Babe. We did, however, fins a bunch of hits for several managers! Congrats for pulling cards from this pack. 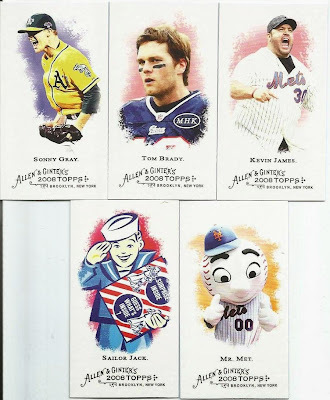 I find it befitting that CaptKirk42's grabbed a card on the 42nd pack of the season. Wow! 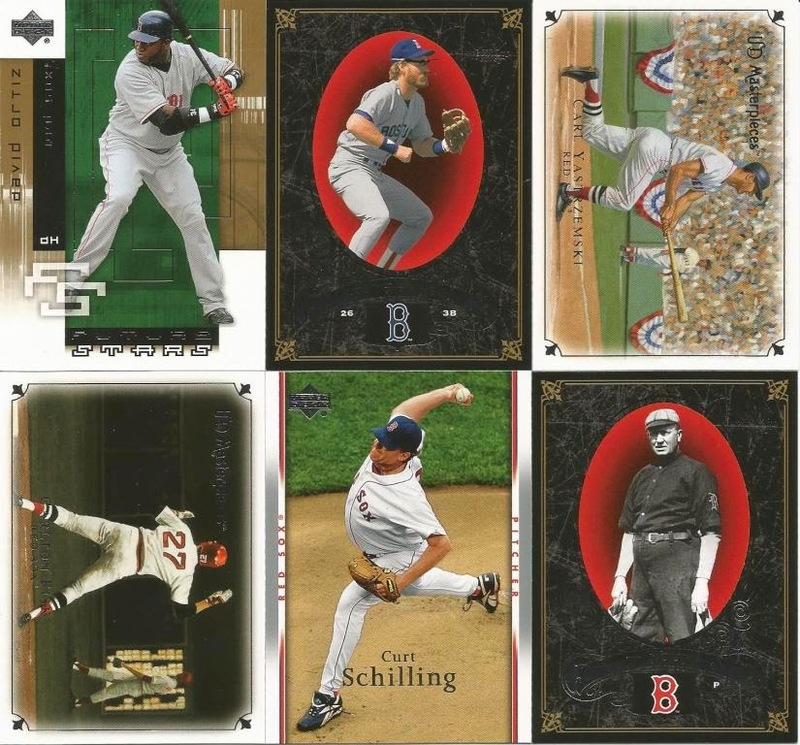 #PackADailyCircus #ootp - padcircus.com is now online! Hello, everyone! I have decided to bite the bullet and start posting the OOTP game online with a paid, real domain. Turns out, it was cheaper than I ever imagined. I am also keenly aware that HOW things are being done are not necessarily the way they are SUPPOSED to be done. You know what? I don't care. Well, I do a little. In any case, you can now find our OOTP game at www.padcircus.com! It is updated as of 05/14/2015. Remember, some teams may still have real players that have no actually been drafted yet. If that's the case, enjoy the player while you can because they may not be on your team the whole season. You may notice some of your drafted players are not listed. They may be on your team's Reserve List and so they don't show up on your online roster page. I'll see if I can fix that, too. You will notice many player pictures are missing. I plan to rectify that by having OOTP generate missing player pics for the next upload. If you notice other issues or general weirdness on the site, please let me know. I'm sure it has to do with the order/manner in which I am uploading the files from my computer to the site. A quick technical note: I can ZIP the files locally, upload them, then unzip them directly in the site. Man, that is so much faster than transferring all the files individually! WAHOO!! Hey, everyone! Thanks for dropping by for today's pack. 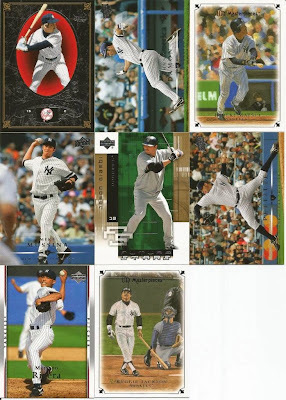 In a previous break, we did an Upper Deck Yankees Fan Pack. 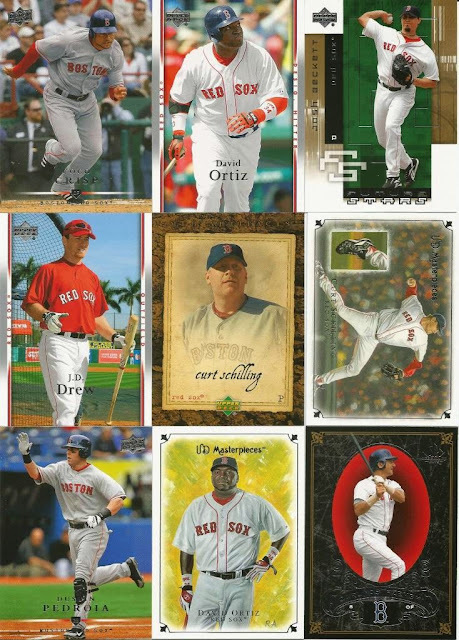 Well, today, we are doing a Boston Red Sox Fan Pack. Before I go any further, I want to apologize to Nachos Grande. 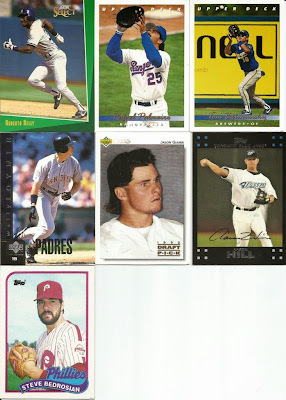 When I opened the box of packs he sent, all the 1991 UD packs were opened. 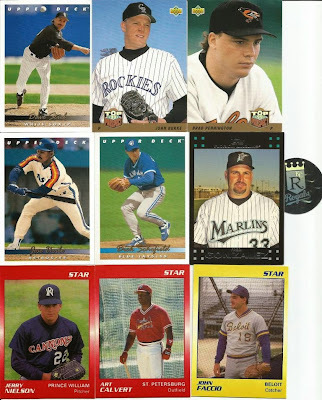 Some of the packs had fewer cards than the specified number on the packs. I thought he had opened them, kept cards he wanted and donated the rest to the break - which is perfectly fine by me, I'll take ANY packs!! As it turns out, he had *NOT* opened the packs. Upon further inspection, every pack is opened exactly along the place where the foil is crimped, suggesting they weren't ripped open, but more like popped a seal. 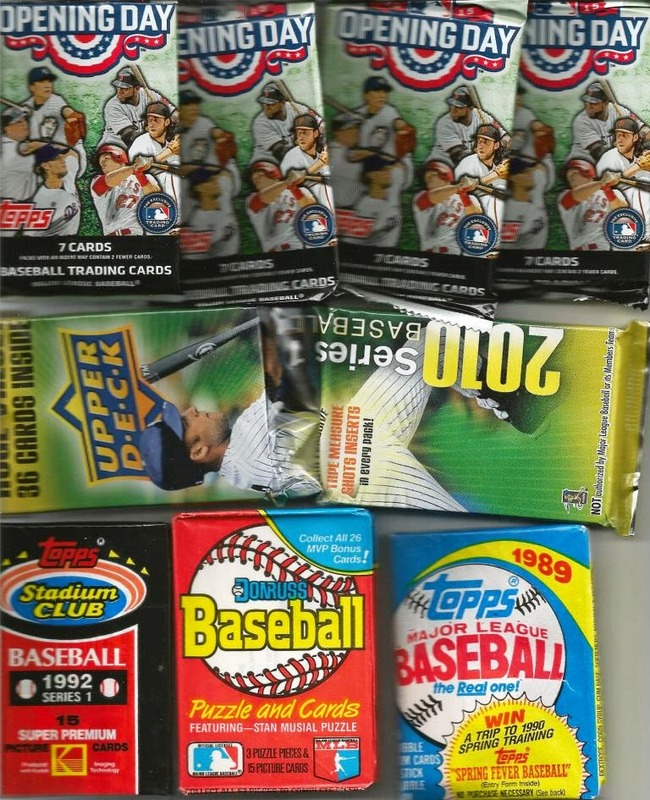 That doesn't explain why some packs were missing cards, but I don't see why anyone else would open the box, search a bunch of 91 UD, leaving the Circa boxes alone, and then reseal things. That just doesn't make sense. So, my public apologies, Chris! BTW, this Red Sox pack was in that box Chris sent as well. Seriously, he sent a LOT of packs! Wow!! Just like the Yankees pack, we have several folks who scored multiple hits from the pack. Thoughts and Sox grabbed 4 hits alone! Congratulations everyone for your pulled players out of this pack! Hey, everyone! Thanks for joining us for another PAD Circus pack break! I am about to release the new draft names to the managers, but before i do, I thought I would break open another pack of custom mini Allen and Ginter! As much as I love seeing folks get cards in each pack break, I have to admit, these are some of my favorites - customs, minis, A&Gs! How do you argue with that? I hope by the time we're done, each manager ends up with at least one! Speaking of "at least," how about the folks here pulling more than one!? Nice job! Congratulations to the rest of us who pulled cards, too. Hopefully, if you haven't managed to pull one of these player, you can snag one in the free agent draft! Hey there, folks! I finally got a chance to run the May 9 draft! Yeesh, we've had CRAZY weather down here - tornadoes, thunderstorms, flooding... All we're missing is the snow. Well, be that as it may, we have the results form the draft. This week's NO SKUNKS were Play at the Plates and SuperDuperMen. The title of this post comes from the MIA SuperDuperMen. I checked several times, both in email and in the draft picks, and the team is simply not there. Not sure what happened to them, but I also checked to make sure I didn't have a "Hey, I never got my picks" email. I did not have one. So, they sat out this week it seems. I knew Kluber was going to be a tough get. Congrats to Play at the Plates! That is definitely one of those times where the NO SKUNK comes in handy for managers. It's all good, though. I'll just wait for my no skunk to some around. I'll get all these processed and shoot out the next draft list by the end of the evening - pending any whackadoodle weather we have! Stay tuned for a pack break later tonight. Hello, everyone! I hope you enjoyed spending time with or remembering your Mom today! I didn't realize until just now that I was a pack off, so tonight I am playing catch-up. And, I have a draft to run. I'm not sure if that will happen tonight (Sunday night) or Monday. We'll see how all this flows and goes! Let's bust some wax. First up, a homemade pack of cards in a 2015 Opening Day wrapper that was gifted to us! All right! We managed a nice split of claimed players and free agents. Congratulations, managers! Wow, who would have thought we'd be cheering on someone to pull a checklist, but that is how things play out during a PAD Circus season! Congratulations to the three of us who snagged cards. The rest? Well, we've added a slew of agents to the pool for the next draft! I will have to run the draft on Monday evening and push out the next draft right after that. Sorry, folks. I'm kind of slacking on the job here lately. Hello, everyone! 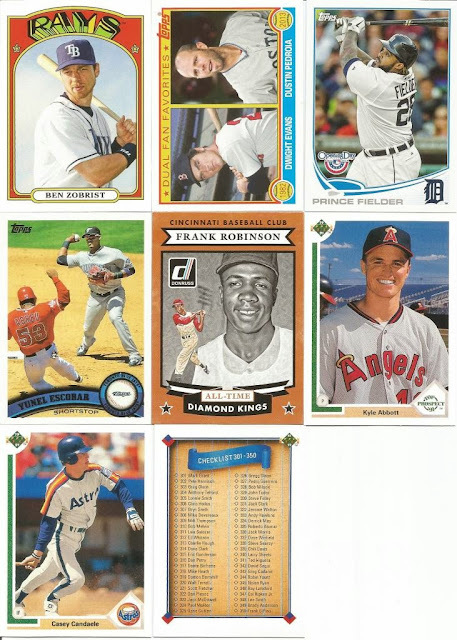 For today's pack, I thought I would bust out a 36-card fat pack from 2010 Upper Deck. Let's see if we can some free agents to the pile that will be up for grabs in the next draft. Well, the thunderstorms Friday night lasted until nearly 8am on Saturday! 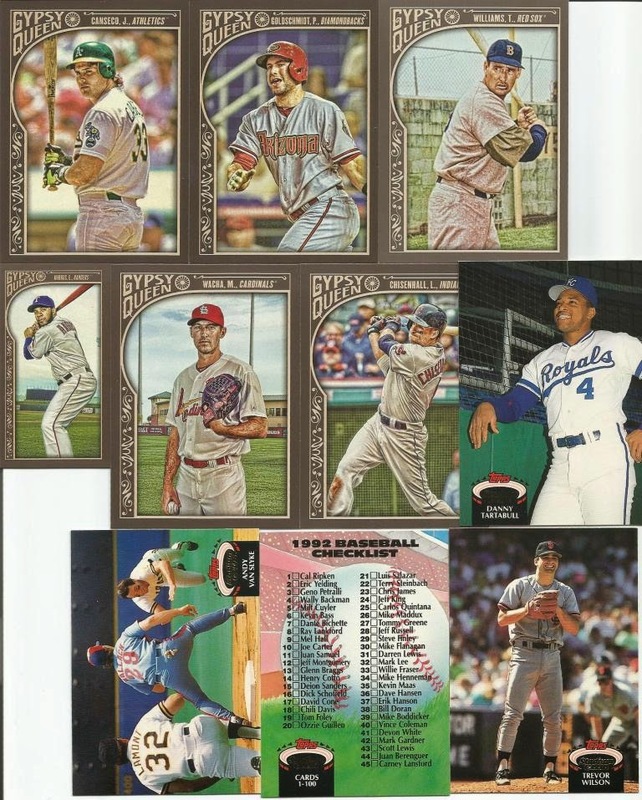 But, we survived and it looks like several folks did really well in this fat pack break! 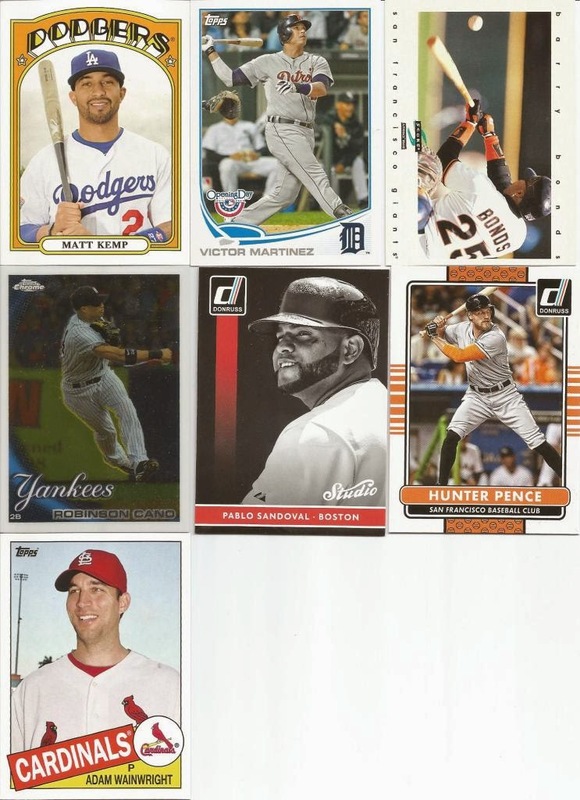 A few folks ended up with multiple hits which is always fun for me as I open up the packs. Congratulations to each manager who snagged some cards from here! We've also added a lot of free agents to the list. Congratulations to our four managers who plucked players from this pack! The throwback card is a neat change of pace. Of course, anytime you can pull a freakin Ryan out of pack, that's a good pack! Tonight's pack is another custom Opening Day 2015, so let's see what surprises await us! Wow, for a brief moment, I thought we might have a perfect pack. That was completely blown away! Congratulations to everyone getting cards here - especially Jobu who snagged a two-hitter! #PackaDailyCircus - 031 - Deja Vu 1989 all over again!? Hey folks! Tonight, I am opening a pack of 1989 Topps. We seem to be doing a lot of the older stuff this season. I'm not sure how you feel about that, but that is the beauty of all this randomness! Wow! Nearly a perfect pack! That is cool. Congratulations to each of the managers pulling players from this pack! When Brian told me that he was looking forward to seeing the homemade packs busted open, I can totally understand why now! These are great fun packs to bust for the Circus. Thanks again!! Congratulations to the managers who pulled cards (including yours truly! Wahoo!!). Tomorrow, I am going for a pack of the mini A&G customs from Nachos Grande. Look for it!